The fire has displaced thousands of people and burned 146,000 acres. Searchers combing through the ruins of the deadliest wildfire in California history found eight more bodies Friday, bringing the number of dead in the Camp Fire to 71 as more than 1,000 people remained unaccounted for. Seven of the eight bodies were found in the town of Paradise, which was all but destroyed in the fire that broke out Nov. 8, and the other was in Magalia, north of Paradise, said Butte County Sheriff-Coroner Kory L. Honea said. All were found inside structures. Honea cautioned that the number of unaccounted for — 1,011 as of Friday night — could include names that are duplicates or have different spelling variations, and that investigators were working to verify them. "I can't let perfection get in the way of progress," Honea said. "It's important for us to get the information out so that we can get started on identifying these unaccounted individuals." The increasing death toll in the Camp Fire in Butte County, north of Sacramento, brought the total number of deaths in two wildfires in the state to at least 74. Three deaths have been reported in the Woolsey Fire near Los Angeles. The Camp Fire has displaced thousands of people and led to the evacuation of some 52,000 at the fire's peak. About 47,200 remained evacuated Friday, officials said. The fire has burned 148,000 acres and was 55 percent contained Friday. The Camp Fire is considered the most destructive wildfire in recorded state history, eclipsing the 2017 Tubbs Fire, which destroyed 5,636 structures, according to the California Department of Forestry and Fire Protection, also known as Cal Fire. It is also the deadliest. The 1933 Griffith Park Fire killed 29 people. The Camp Fire was one of two major wildfires burning at opposite ends of the state. The Woolsey Fire, which also broke out the same day, has burned more than 98,300 acres and destroyed at least 713 homes and other structures, officials said. It was 78 percent contained Friday. It had prompted evacuation orders covering more than 200,000 people. The Camp Fire has destroyed at least 9,700 single-family residences, 144 multi-family residences and 336 commercial buildings, according to Cal Fire. Some of those displaced have taken shelter outside a Walmart in Chico, west of Paradise. Peggy Alldrin, who has lived in Chico for almost 60 years, said she considers Paradise “like my backdoor” and has been going to the Walmart to hand out blankets and gift cards to the evacuees. "To see this is devastating … Watching it on the news, how can you sit at home?" she said. Brenda Rockwell, who has lived in Chico for 30 years and who grew up in Paradise, has been serving from 300 to 500 cups of coffee a day to those seeking refuge. "I thought, if they’re like me, coffee gets your day going. They're like anybody," she said. "You know what, there's kids — cocoa, coffee, it's a way to get them started. Keep them warm during the day." Officials warned that winds in the area of the Camp Fire are expected to pick up this weekend and could fuel the still-burning fire. Alex Hoon of the National Weather Service said red-flag warnings which are issued for "critical fire weather conditions," would be in effect Saturday night through Sunday afternoon. 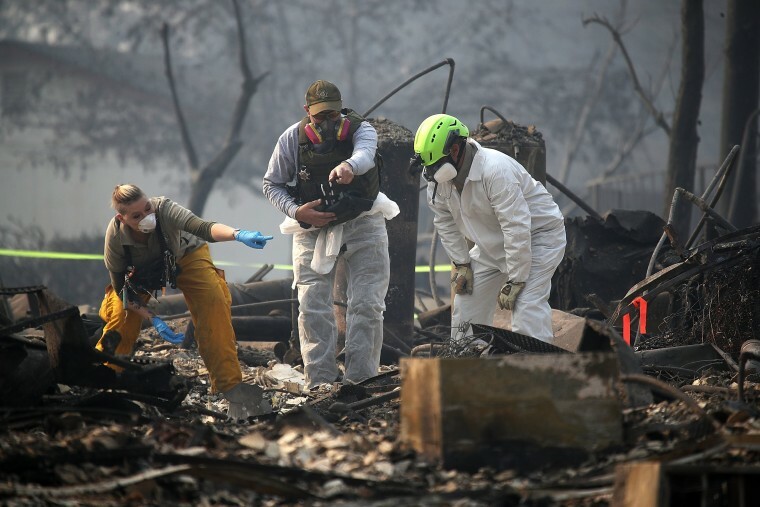 Honea said that of the 71 known dead in the Camp Fire, investigators have tentatively identified 58. The names of two people who died in the fire were released Friday: Paula Dodge, 70, and Randall Dodge, 67. Monterey County sheriff’s Commander Joe Moses, who is managing the Camp Fire search effort, said Friday that searchers have to comb through more than 10,000 destroyed structures. They have been conducting door-to-door and car-to-car searches in the southern portion of the evacuation zone, where there was less damage, to allow residents to return to their homes. They also have been searching for missing people, a top priority, in Paradise and other communities. When asked how large an area must still be searched, Moses replied, "Huge." President Donald Trump is scheduled to travel to California on Saturday where he will meet with those impacted by the wildfires, the White House said. The president has signed a major disaster and emergency declaration, which provides federal aid. Another fire, the Hill Fire which broke out in Ventura County on the afternoon of Nov. 8 and burned more than 4,500 acres and destroyed four structures, is 100 percent contained. Fire officials said all possible causes besides human activity have been ruled out in that fire, and authorities have announced a $10,000 reward for information leading to anyone responsible for the wildfires. The Hill Fire prompted evacuation orders for around 1,200 people as it raged last week, Cal Fire has said.